Enjoy real Oklahoma-style country food, seasoned with a side of music from this honky-tonk's country star owner. : The building’s Bricktown Canal location makes the outdoor dining under a vine-entwined pergola both romantic and a study in people-watching. The kitschy interior is reminiscent of a country video, with a disco ball-esque reflective saddle slowly rotating high over the bar, which is the centerpiece of this 12,000-square-foot restaurant and live music venue. As you wait to be seated --- reservations are not accepted --- let your feet dangle off of the “Redneck Loveseats” (pick-up truck tail gates). 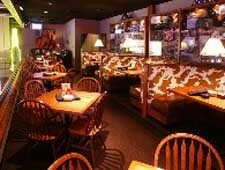 Seek advice from your server when considering menu specialties like Toby Keith’s own country-fried steak recipe, the meatloaf, and Cowboy Caviar (black eyed peas). Other items like the hamburgers and salads are a bit disappointing. The pies, however, are homemade and good with ice cream. Menu quirks include a sirloin on the kids’ menu and a free burger meal for active-duty American soldiers. Stop by the souvenir shop before you leave to purchase the special spice rub you enjoyed or a T.K. T-shirt.